Those were Timea Bacsinszky’s words describing Jelena Ostapenko after she lost to the 20-year-old in the Roland Garros semi-finals. Ostapenko’s sheer power and carefree shot-making has mystified her opponents on her way to the Roland Garros title. Entering the tournament as the world No47, Ostapenko had never won a tour-level title, had never won a match at the French Open, and never featured in the second week of a Grand Slam. Her three-set win over No3 seed Simona Halep in the final on Saturday has changed all that. Becoming Latvia’s first-ever Grand Slam champion, Ostapenko blasted through the draw, taking out reigning Olympic champion Monica Puig, ex-US Open winner and 2010 French Open runner-up Sam Stosur, ex-world No1 and former US Open runner-up Caroline Wozniacki, and finally two-time Roland Garros finalist Halep. Ostapenko, who turned 20 four days ago, almost came out of nowhere and left a lasting impression on everyone who has set eyes on her. The legendary Martina Navratilova told Ostapenko’s coach Anabel Medina that the strokes of the young power-hitter remind her of those of Lindsay Davenport. The freshly-crowned French Open champion hit 299 winners over seven matches this fortnight. Her last point of the tournament was a bullet of a return winner down the line. “I still cannot believe I won the title, because my dream came true. So, yeah, I was just trying to go for shots when I could and match point. And I was just, ‘Okay, I have nothing to lose, I’m just going to hit winner’. 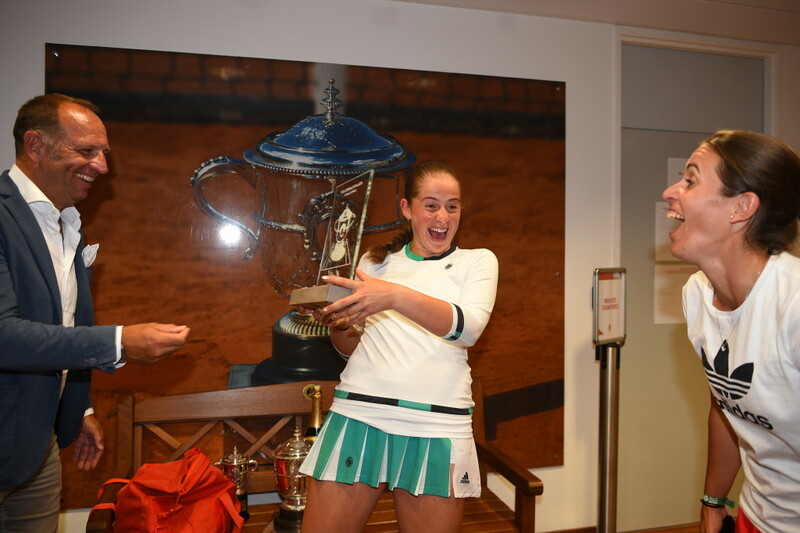 Or if I miss, okay, I have another one,” said Ostapenko of that last shot that secured her the title. She was down 4-6, 0-3 against Halep in the final, and again down 1-3 in the decider, but came back to take the trophy. “I’m surprised,” said her mother, Jelena Jakoleva, with a smile after the final. Ostapenko had been coached by her mother all her life but she added Medina to her coaching team at the start of the clay season. It is a partnership that has paid immediate dividends. “There are no words for that,” Medina said of her charge’s unexpected comeback against Halep. Ostapenko made history in more ways than one on Saturday. She became the first major winner from her country, the first unseeded women’s champion at Roland Garros since 1933, the youngest women’s Grand Slam champion since Maria Sharapova at the 2006 US Open… the list is quite extensive. “I heard some stories that I made a lot of history here and for my country and for the tournament also but I’m just really happy to play here,” said an unfazed Ostapenko. The former Wimbledon junior champion speaks the same way she plays. Energetically, but in short, rapid, successive sentences. Medina describes her as “hyperactive” and her mother says she was a handful when she was young. “She was the same when she was a kid, it was very difficult. She was dancing, swimming, playing tennis, football… so many things,” said Jakoleva. The combination of power and “recklessness” as Bacsinszky said made Ostapenko an unstoppable force in Paris. The young Latvian says she is just as daring off the court. “I’m also a bit like an extreme person,” said Ostapenko. Huge congrats to @anabelmedina , has a lot of credit for this title. Amazing work w Ostapenko and an even better person. But where does all that firepower come from? “I think I’m really powerful and I was just born with that power probably. Of course I’m working in the gym and stuff but I think I was just born like this,” she says with a smile. Ostapenko grew up competing in ballroom dancing alongside her tennis and only fully devoted herself to the latter when she was 15 years old. Till this day, she practices ballroom dancing four times a week when she is at home in Latvia. “I went to one of her lessons in Riga and I saw her dancing with the teacher, I think it’s something that makes her feel better, she really enjoys doing it, so why not keep going?” says Medina. After being coached by her mother for so long, what drove them to consider bringing in a fresh set of eyes to help coach Ostapenko? “It’s very difficult to be the mother and coach all the time. Being together all the time, on court, in the hotel, in breakfast, dinner, lunch, shopping, it’s difficult,” said her mother. During the first week, Jakoleva watched her daughter’s matches from home and even when she flew in to Paris, she followed her fourth round against Stosur and quarter-finals against Wozniacki on TV in her hotel. “I think Jelena has more focus if I am not in the stands,” admitted Jakoleva. She was able to perform with or without her mother in the stands. Medina is impressed the most by Ostapenko’s self-belief and it’s evident in how she navigated those two weeks. “I think if I have really good day and I’m hitting really well, I think anything is possible,” is how the 20-year-old puts it simply. She certainly proved that in Paris! 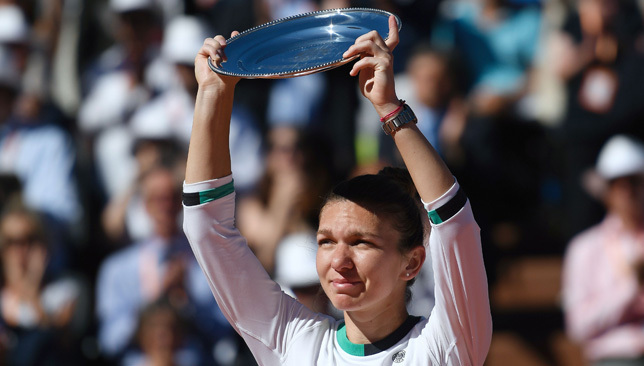 Halep lifts her runner-up trophy in Paris on Saturday. Both Simona Halep and her coach Darren Cahill used the phrase being a ‘spectator on the court’ when they describe what it’s like facing Jelena Ostapenko’s shot-making at times. The third-seeded Halep missed out on a chance to win her first Grand Slam title and rise to No1 in the world when she was stunned by the 47th-ranked Ostapenko in three sets on Saturday in the Roland Garros final. Halep was up 6-4, 3-0, and was again up 3-1 in the deciding set, before she eventually succumbed to the barrage of winners off the Ostapenko racquet. The 20-year-old Latvian finished the tournament with a total of 299 winners through seven matches in Paris – 54 of which came against Halep. “She played really well, all the credit. She was hitting very strong. At some point I was like a spectator on court. She deserved to win,” said Halep, who has now lost two French Open finals. Halep, who fell to Sharapova in the 2014 Roland Garros final, entered the match against Ostapenko as the favourite. She had dominated most of the clay season, winning Madrid and reaching the final in Rome, and had experience on her side. Ostapenko had never won a tour-level title, had never won a match at the French Open prior to this fortnight, and was the youngest finalist in Paris in 10 years. But none of that matter as the Latvian power-hitter overwhelmed one opponent after the other with her monster groundstrokes and carefree attitude. Halep doesn’t believe she did much wrong on court and neither does her coach, Cahill. “She played really well in the very tough moments for her when I was up set and 3-0. So I can say I was there, I was close, but again, I lost it. I cannot change anything, so I just have to look forward,” said the Romanian. Cahill had briefly walked away from his partnership with Halep after Miami in March due to her negative attitude during matches but reunited with her prior to the clay season. The Australian coach believes Ostapenko stepped up when she was down a set and break, rather than seeing it as Halep having a letdown. “Simona didn’t do much wrong,” says Cahill. “She played to the plan and she put the ball back that extra time, and Jelena just kept coming up with great shots. Jelena won this match, Simona did not lose it. Halep said during her on-court interview that she had been “sick to her stomach” with nerves prior to the match. A win would have made her the first Romanian woman to ever rank No1 in the world and just the second to win a Grand Slam behind her manager Virginia Ruzici. She describes the 24 hours prior to the final as “tough”. “I was very close to take the first Grand Slam and also No1 in the world. So it was a little bit of like emotional moment, but that’s it. I think everyone has it, and it’s good. So I want to have many more if it’s possible. That’s why I work 20 years and played 20 years to have this moment,” said the 25-year-old, who will rise to No2 in the rankings on Monday and will lead the Porsche Race to Singapore standings. Halep has had issues before with being too self-critical and coming down hard on herself, particularly during matches. She has worked tirelessly with Cahill recently to rectify that problem and the worry now would be that a defeat like this in the French Open final would set her back emotionally and mentally. Cahill is optimistic that won’t be the case. “I have faith that eventually she’ll get over it,” he says. “It’s her second Grand Slam final, it’s obviously a wonderful thing to make it through to the final and it’s difficult to win them and that’s why they’re so special when you finally do win one. Many players before lost in multiple finals before they finally won and Simona is just going to have to dig deep and keep working hard, come back stronger and give herself another chance. Halep’s status in Romania is huge and she shoulders immense pressure of expectation from her followers back home. Scores and scores come out to support her everywhere she goes and Cahill believes she deals with it all impeccably well. Halep and her coach Cahill with Ion Tiriac the day before the final. “I think she handles that like a pro. I don’t know anybody that loves their country more than she does,” he says. “She loves going back there, she loves the people in Romania. I hope they get behind her, and I’m sure they will because they’re a passionate country, passionate people, she loves spending time there. If she’s a little bit down over the next week or so, they’ll certainly pick her up. In one way, Halep winning her first major and rising to the top of the rankings would have brought a sense of stability to the women’s game at a time when many of its powerhouses like Serena Williams, Victoria Azarenka, Maria Sharapova, and Petra Kvitova have been absent. But Cahill believes Ostapenko’s win and the women’s tournament in Paris this fortnight have been equally beneficial to the WTA. “I think the whole tournament has been a plus for the women’s game,” he says. “I think there’s been a lot of wonderful matches, not just from Simona’s side but certainly from the other side. And the fact that at the moment you can have a dart board and you can throw a dart and any number of women can step up and make it through to a final or win one of these tournaments, I think that creates a lot of interest in women’s tennis. As for Halep, she knows this loss will be painful for a while and admits she needs time to get over it. Rafael Nadal spent the second week of last year’s Roland Garros on a boat with his girlfriend, trying to forget the agony of injury that forced him to withdraw from the tournament after the second round. Halep too must find her own version of that getaway. “This one hurts a lot maybe because I am more – I realise more what is happening,” she says, comparing this defeat to the one she suffered to Sharapova in 2014. Rafael Nadal watched his beloved football club Real Madrid chasing ‘La Decima’ for 12 years before they finally achieved it in 2014. The club’s and fans’ obsession with winning a 10th European Cup (Champions League) trophy took on a life of its own, and it made it all the more sweeter for Los Blancos and their Madridistas when they ultimately sealed the deal against Atletico Madrid at Estadio da Luz in Lisbon. 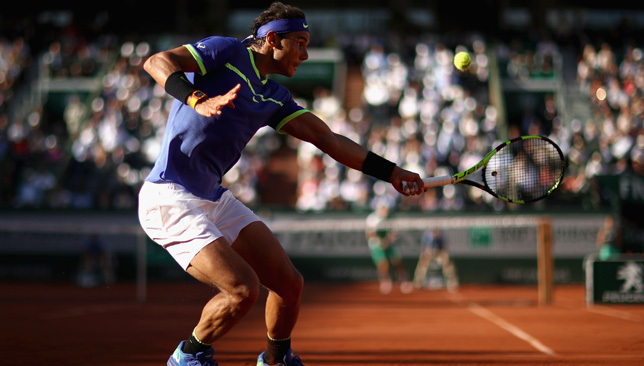 On Sunday, Nadal has a chance to secure his own ‘Decima’ at Roland Garros. And while the Spaniard and his entire team have downplayed its significance – “Nine is my favourite number,” he joked on Friday – it will still be a historic feat many fans and pundits are salivating over. If Nadal defeats Stan Wawrinka in Sunday’s final, he would become the first man ever and second player in history to win 10 or more titles at the same Grand Slam event (only Margaret Court has won 11, at the Australian Open). The Mallorcan’s last Grand Slam title came three years ago at the 2014 Roland Garros and his bad luck with injuries meant that some people had written him off and never thought he would be in this position again, fighting for a major trophy. But Nadal this year has silenced his doubters as he reached the Australian Open final in January then won three titles in Monte Carlo, Barcelona and Madrid in the build-up to Paris. The prospect of him lifting a 10th Coupe des Mousquetaires at Roland Garros on Sunday is described as “outrageous” by former world No1 Lindsay Davenport. “It’s so amazing. Just as he’s been gathering momentum all year, the final in Australia, the final in Miami – whenever he plays well on hard court, you’re like watch out on the clay, which is exactly what happened,” Davenport said in Paris earlier this week. His co-coach Carlos Moya, a champion in Paris 1998, made sure ‘La Decima’ was not discussed within the team, and he struggles to find the words that would give the achievement justice. Nadal has given one impeccable performance after the other throughout the fortnight in Paris, dropping just 29 games over six matches. He owns a 78-2 win-loss record at Roland Garros and has never lost a final here. “To win 10 of anything is phenomenal. The frightening thing is that he’s won more titles here than I’ve actually won matches,” jokes 1987 Wimbledon champion Pat Cash. “He brought something to the game with tennis we’ve never seen before and particularly this Centre Court accentuates those strengths that he’s got, it’s quite phenomenal watching it happen. Active players are also keeping an eye on Nadal’s quest for a mythical 10th. Poland’s Agnieszka Radwanska tipped the Spaniard to pull it off when she spoke to reporters in Paris during the first week of the tournament. “That’s something for sure unbelievable. I believe he can do it. He’s playing amazing tennis this year on clay, winning all those tournaments on clay already,” said Radwanska. His opponent in Sunday’s final, Wawrinka, is not daunted by the fact that he will be standing between Nadal and that unprecedented achievement. “I think to play Rafa on clay in French Open in a final is probably the biggest challenge you can have in tennis. He’s the best player ever on clay. As you say, he’s going for his 10th Roland Garros, so it’s something really impressive, something tough,” said Wawrinka on Friday. “It’s for sure gonna be really difficult. But again, in the end of the day, it’s the final. The pressure is on both players. No one go on the court thinking he has no pressure. We both want to win the title, and we both gonna give it all on the court. We find out on Saturday whether Nadal will do it, or if Wawrinka will claim his own place in history as the first man to ever beat the Mallorcan in a Roland Garros final.